Once a week I post interviews with interesting designers about their insights on their experience of working in the Knitting industry. I’ve noticed that every designer makes their living in a slightly different manner bringing their own unique presence to the Knitting world. You can find Woolly here and here on Ravelry. Inspiration comes from all around me – I'm very much a 3D person and have acute spacial awareness, so even the simplest of shapes takes on a sculptural form in my mind. I particularly love the shapes of shells and succulent and sea creatures; forms that come from nature that have the most amazing clarity and mathematical structure. And circles and spirals. Anything with circles in or on gets my attention! What is your favourite knitting technique? Oh, I don't think I have a favourite. 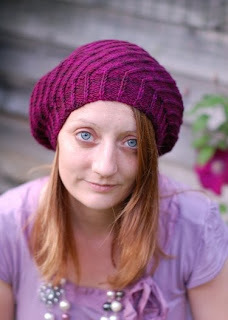 I love seamless knitting, but that doesn't have to mean knitting in the round. 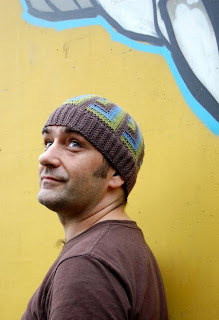 I love the challenge of kitchener stitch and have used that a great deal in my work (my first book, 'Going Straight' was a collection of Hats knit sideways and grafted) If a technique can give me a professional finish or perfect shaping I'm pretty much going to love it. I'm really into alternate cable cast-on as a cast-on for ribbing's at the moment, as it's so quick and extremely versatile. How did you determine your size range? I include as many sizes as possible, normally a minimum of 3. I have a personal design rule, in that all of the sizes must come out of 1 skein or 100g of the given yarn. This often means that I'll reconfigure a design if the yardage won't work for all sizes. There's a bit of a bee in my bonnet about the general sizing of Hats, in that one size does not fit all, or even most. I myself come from a family of large headed people, and after years of finding most Hats (even men's!) too small I've come to appreciate the value of a graded Hat pattern. Do you look at other designers' work or are you afraid that you will be influenced by their designs? 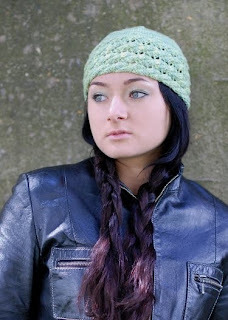 I do look at other Hat designs, as I like to see what else is going on in my area. I do worry that I may absorb someone else's idea and do try to avoid designing something that looks like the work of another, but at the same time I know that's near on impossible to achieve. We all absorb ideas and inspiration from the things we see, consciously or not, and it is how the design process works. How many sample/test knitters do you have working for you or do you do it all yourself? I have a small army of test knitters, and we operate through a private chat group. They don't all knit each pattern all of the time, but every size is test knitted. They are a fantastic team. Did you do a formal business plan? Nope. My business has grown organically, and I'd like it to stay that way! I appreciate that a business plan will work for many people but they don't work for me. What impact has the Internet had on your business? My business wouldn't exist without the Internet. It grew from blogging and my love of knitting, traveling and Hats. I received so much support and encouragement from my readers and I can't thank them enough. There's a new book out called 'Brave New Knits' which is all about the impact of the Internet on knitting and knit designing and I'd really recommend it. Do you use a Tech Editor? Absolutely! I've started using 2 for each pattern, as it helps tighten the net that little bit more and prevent errors getting through. I have a few different editors that I call upon, and each has a different perspective to bring to the pattern. How do you maintain your life/work balance? With difficulty! This is the next thing on my list to sort out, as work is increasingly creeping into my family time and it needs readdressing. It is difficult to divide; customer service often dictates anti-social hours, and most creative jobs won't fit into a 9 to 5 regime. When the ideas strike, they can't be ignored. How do you deal with criticism? I'd like to say after 5 years of being in this business that I've developed a thicker skin, but the truth is that some days criticism still gets to me. Constructive criticism is welcome and I'll always ask for feedback. It's the random things flown out without much thought that sometimes throw me off track. Mostly though I remind myself that we all have entirely different tastes and priorities and provided the majority of my customers are happy and that I'm doing the best I can, then I'm happy. How long did it take for you to be able to support yourself? About 3 years? 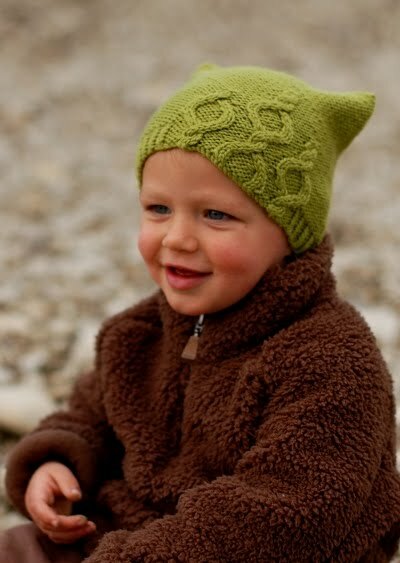 Currently, what I earn from knit design supports my family, though we do live a very simple lifestyle that can afford us both to be at home with our son and manage on a low income. It's incredibly satisfying being able to live off my wage, but it's a huge responsibility too. What advice would you give someone who wants to pursue a career in knitting? What will they Knit Next? Skill Levels - What do they really mean?